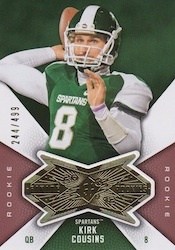 Making its collegiate debut as a standalone set, 2012 SPx Football brings most of the familiar elements collectors have come to expect from the brand over the years. Focusing largely on the 2012 NFL rookie class, boxes have four hits including a Rookie Auto Jersey numbered to 399 or less. 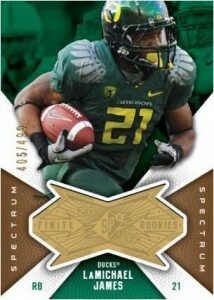 Boxes also promise two numbered SPx Finite Rookie inserts. Those familiar with the SPx brand won't be surprised to hear of the Spectrum and Radiance parallels, names long connected to the set. While Shadow Box cards pop up as a case hit, new Shadow Slot cards fall three per box. The interchangeable acetate cards encourage collectors to create their own Shadow Box-style cards. 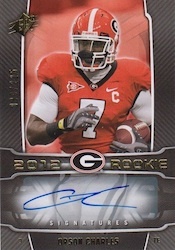 The 2012 SPx Football set includes a challenging configuration of 50 base cards, 35 Rookie Auto Jersey cards, 60 SPx Rookies and 60 SPx Rookie Signatures. 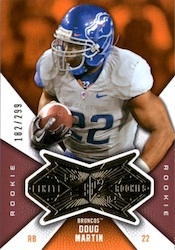 Rookie Auto Jersey cards are numbered to 399 or less and fall at least one per box. The SPx Rookie cards are numbered to 750. Every box has two. 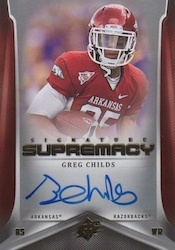 SPx Rookie Signatures are numbered to 225 copies. SPx Finite Rookies come in three levels of rarity. All are numbered to 499 or less. Parallels: Radiance and Spectrum. 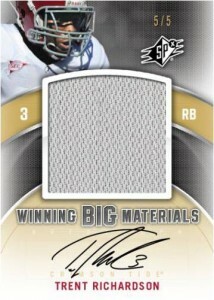 Winning Big Materials (#/199) boast over-sized jersey swatches. The always popular SPx Shadow Box cards are included as a case hit. 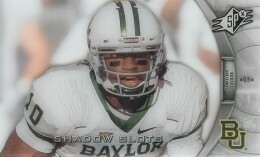 Making their debut are Shadow Slot cards. These acetate cards have a slot that allows collectors to create their own Shadow Box-style cards. Falling three per box, some Shadow Slot cards are rarer than others. 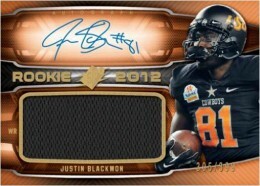 Autographed Shadow Slot cards are also included. Great product. The pictures are similar to other Upper Deck products but I have come to expect that. The cards themselves look nice and the autographs come in enough varieties to keep me coming back for more, especially trying to chase the dual autos. My biggest complaint is that the base set is too easy to get, I have two complete sets after two boxes, so if you like taking the time to build sets find something else and look for the autos from SPX. Otherwise, highly recommend.